Letter from Primo(?) 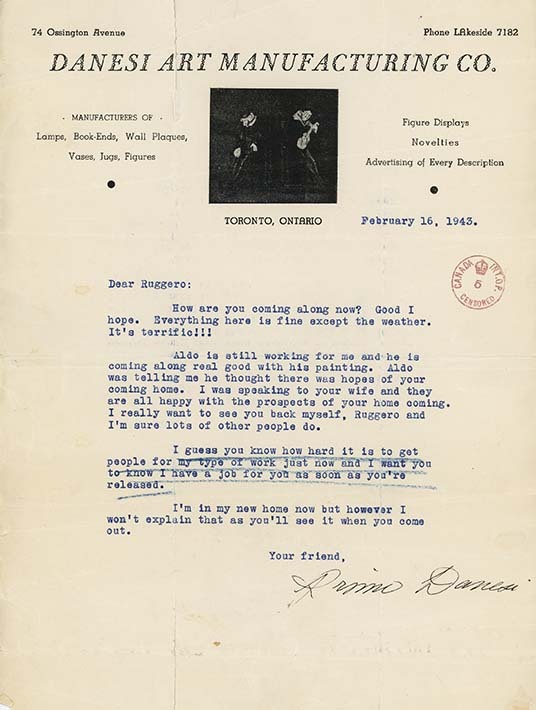 Danesi, to Ruggero Bacci, Toronto, ON, February 16, 1943. The letter is sent on stationary for the Danesi Art Manufacturing Co. Prior to his arrest, Ruggero Bacci had been working for the Florentine Lighting Company. He was arrested at his workplace along with co-workers Antonio and Pietro Danesi. The exact relationship of the Danesi brothers to the writer of this letter is not known. The writer notes that Bacci's son Aldo is employed by the company, and implies a strong friendship between himself and the Bacci family. How are you coming along now? Good I / hope. Everything here is fine except the weather. / It's terrific!!! / Aldo is still working for me and he is / coming along real good with his painting. Aldo / was telling me he thought there was hopes of your / coming home. I was speaking to your wife and they / are all happy with the prospects of your home coming. / I really want to see you back myself, Ruggero and / I'm sure lots of other people do. / I guess you know how hard it is to get / people for my type of work just now and I want you / to know I have a job for you as soon as you're / released. / I'm in my new home now but however I / won't explain that as you'll see it when you come/ out.